Hi Guys, after some advice, I picked up my Tuono on Tuesday, after wanting one for quite a while, any way all seemed fine on the test ride, but on the way home it started to cut out, felt like it was out of fuel, or maybe a blocked filter, it got worse as the engine got hot, and once the fan cut in, it would stop completely and not restart until it had cooled down ( fan cut in around 96C). So after having a little mooch around here, and a few other places I'm sort of coming to the conclusion that the stator has burned out. 1 Do I really need to spend £700 on a genuine Aprilia stator, not to mention a new reg/rec? Wemoto list a pattern part for £160 ish and the reg rec for about 140, and M&P have a a stator for £110 and reg/rec about the same. 2 how difficult is it to fit? I'm ok with basic maintenance, but anything advanced and it goes to a mechanic. 3 Shall I replace the battery as well? it seems ok, but if it is the stator thats gone will it damage the battery? 4 Could it be fuel related, and I'm panicking about nothing? Its an 07 Tuono by the way with 18k miles on it, and from what I can see thats about the mileage when the stator dies. First thing to do is charge up your battery - dont try and start it without the battery being fully charged - you will fook your sprag clutch. as above !!! take it back that's the first step !! . if you do decide to diy make sure you prove the problem as felix states with a multi meter .mine went a bollock earlier this year in france !! . all 3 phases ( the yellow wires ) were looping to earth . there are loads of videos on youtube to show you how to do this , also aprilia performance in tamworth west mids do a video diary with loads of specific "how to,s ". if you do decide to diy and are a bit unsure you can pm me . as the replacement procedure is very fresh in my mind !!!!! If not replacing the stator is not so hard if you have some mechanical ability. Thanks for the replies chaps, unfortunately I bought it as a part ex trade sale so sold as seen. To be fair to the dealer I doubt they bothered road testing it, but the guy that traded it must have known there was something wrong, when I get the v5 I'm going to write to him, he owned it for 7 years. So back to my original question, is the genuine part worth the extra wonga over a pattern part? and is upgrading to the later stator easy or do I need to change anything else? Blade I thought about a rewind, but as its the earlier stator, is it worth it? Also I'm guessing from your replies that its not likely to be fuel? You need to test what you have before removing / replacing anything. You can't test a stator once it is removed from the bike. It's a 10 minute job with a multi meter to test the battery & stator - all you need to do is remove the seat to get at the battery & unbolt the coolant reservoir to access the "brown connector" for the stator. 3) Start up the bike - measure the voltage across the battery again - at idle. 5) locate and disconnect the brown connector. - Think of each connectors as A / B & C - doesnt matter which you label A etc..... just make sure you measure the 3 possible combinations. Last edited by felix; October 9th, 2018 at 10:35 PM. with reference to stator,s , the replacement stator I bought is slightly smaller in outside diameter than the original aprilia stator . as the voltage output is generated using the magnetic field from the rotor ,and the rotor spinning on the outside of the stator the increased air gap between the new stator and the original rotor should in electro mechanical theory reduce the generated voltage , due to the decreased magnetic field . so may be the aftermarket stator may work better than the original . it would be interesting to compare the earlier and later stators side by side for physical differences. if your stator is completely bolloxed each yellow wire will be earthing out , ie positive lead of your multi meter connected to each yellow wire in turn and meter set to ohms loop and negative lead connected to the engine , if they all give full sweep all 3 phases are earthing to the engine ,as the insulation on the stator winding has burnt ( as was the case for me ) . keep us all updated dude !!! I'm doing something wrong, can't get a reading from the brown connector. I've made sure the meter is in ac and tried different ranges but nothing. it must be something simple, any pointers? Did you separate/ unplug the brown connector before testing ? Last edited by felix; October 10th, 2018 at 10:53 AM. Yes you did say to disconnect it, its the smaller bit, the big bit has the spades, should have taken a piccie, but on mine the big bit is brown and the small bit is black. the black bit has wires that look braided, and the bigger brown bit has normal plastic coated wires. what do you think of the values at the battery? 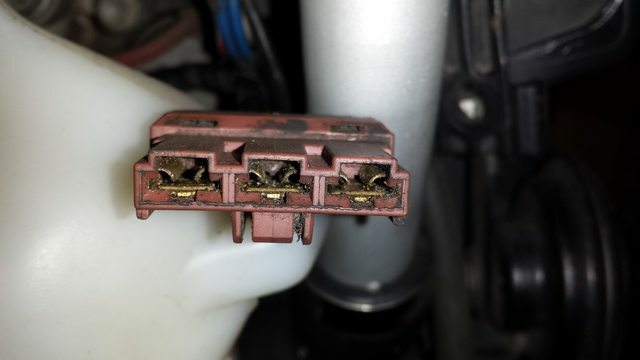 A constant 14.1v @ 2.5k seems good to me & would indicate that your stator is charging the battery ok.... but dont understand why you arnt getting any readings at the brown connector .... especially as the battery is charging..
AFAIK all gen 2's have a brown / brown connector from new. hilift - Any Ideas ? Last edited by felix; October 10th, 2018 at 11:34 AM. I know I said I was a bit thick, but yeah the engine was running. Perhaps I could have worded that better ! ! from memory although a bit cloudy !! I thought the stator was the male of the plug and the rec/reg is the female . that is the female in the pic !!!! . good luck !! battery readings sound promising , but the stator still could have lost a phase , 2 out of 3 will still give a small charge . the stator cable goes upwards behind the coolant tank and the rec/reg end goes down wards .from the connector .